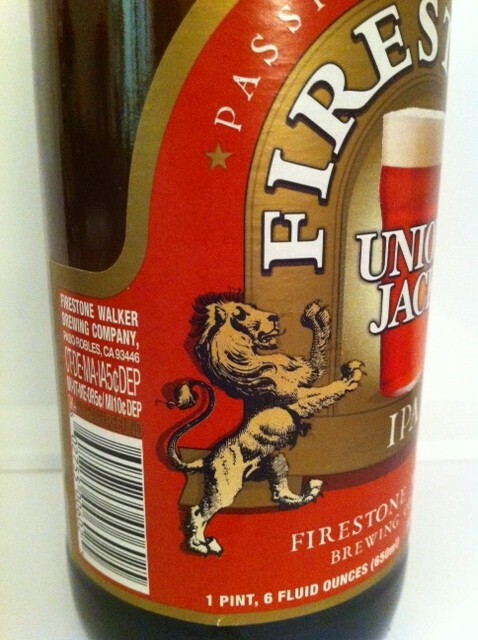 Firestone Walker Union Jack IPA. There are times when you can only describe something as being quintessentially 'English'. Nevermore so when it is a beer that depicts England at its jingoistic best, that would bring a ruddy smile from John Bull himself! A label can be a fairly good indicator of what contents might lye within. A British style IPA for example may be a fairly strong affair, with subtlety of flavour being the hallmark and Fuggles and Goldings being the traditional hops of choice. So when you come across a fervently patriotic looking brew that would look every bit as comfortable gracing the shelves of any self respecting Independent retailer in the UK, only to find out it is made some 8000 miles away, it turns all this logic squarrly on its head! 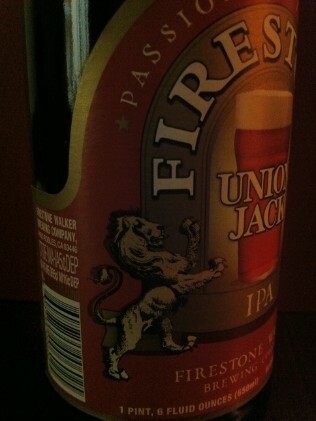 The beer in question was Firestone walker's Union Jack IPA, at a true Calcutta bound strength of 7.5%alc/vol. Not made, as you may believe close to the River Lea within the sound of Bow Bell, but in Paso Robles, California, on the American West Coast! So how does a beer that looks every bit a creation of the Old World come to be made in the New? The British connection comes in the form of David Walker, who along with American Adam Firestone established the company in 1996. The family name Firestone ( more familiarly know globally as the tyre giant) has since 1974 run a winery in Santa Barbara (sold in 2007) but the brewery has never been an off shoot of the operation and always run Independently. 'American style IPA' is now recognised, and admired, worldwide as a style in itself, but some US brewers also attempt to produce a beer within their range which more closely mimics the British style. Given the patriotic look, is Union Jack IPA one such beer? Well, the answer really is - no. The brewery has the British style already catered for with their Double Barrelled Ale (or DBA at 5%alc/vol, using traditional East Kent Goldings) and to get the beer as stylisticly close as possible uses the Union system of fermentation for the brew ( a portion of which goes into several other of their brands along the way). The Burton Union fermentation system was considered the defining method in producing the classic Bass ales of old and currently only used by Marstons in the UK. 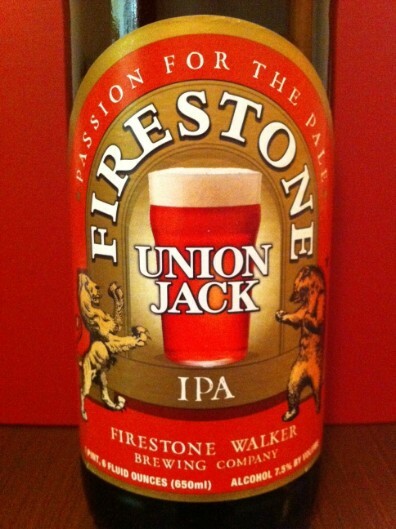 So what style of beer is the Union Jack IPA? The colour is deep golden hue and a hugely aromatic aroma, with notes of pine needle, spiced herbs and citrus. Very clean and heady aromas suggest there is alcoholic backbone and at 7.5%alc/vol. this is so. The flavour delivers these heady hop aromas along with a warmingly smooth barley twist and candied fruit maltiness . What is impressive overall is the balance of the beer ( and is not top heavy on alcohol) with all the flavours well integrated and in harmony. For a beer of this strength it goes down perilously easy! The beer then reflects the new age of US brewing flavour identity, originality, and confidence, whilst paying homage to the IPA's roots, and is a beautifully crafted brew. Union Jack IPA would be a a beer style unfamiliar to John Bull - but one he would know doubt have liked to have become acquainted with! He would be pleased that there is still a former colonial outpost flying the flag, that will forever champion IPA, with their passion for the pale!